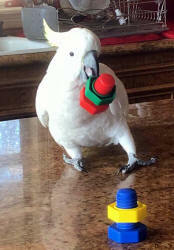 Sydney (above left), is a Greater Sulfur Crested Cockatoo who came home with us from Australia. He has to work for his toys ... so he's bringing me one of his Nuts & Bolts on Christmas Day 2017 so we can screw around (pun intended). Next is a Greater Vasa, "Vasa Madda You" aka Maddie who is very mechanical minded so she has taken a piece from another toy to make her own creation! 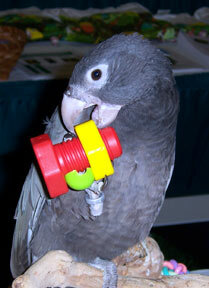 Great toy for those birds who are mechanically inclined (colors & shapes vary). 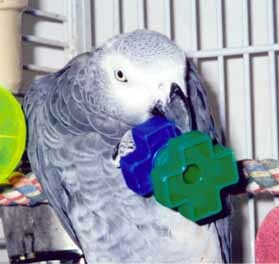 Sammy (the grey) is having fun with his nut & bolt!